Sleek and modern, our extra-large 3-Panel Gallery Wrapped Stormy Dreams World Map radiates an enchanting flair that is sure to inspire wanderlust for a lifetime. The rich texture of the canvas paired with the unique charcoal blackboard effect of the oceans enhances the subtle beauty of the continental terrain. This frameless travel map is not only a stunning interactive art piece for your wall, the modern 3-panel gallery wrap design and high level of detail ensures it doubles as a fun way to track and show off your travels around the globe. 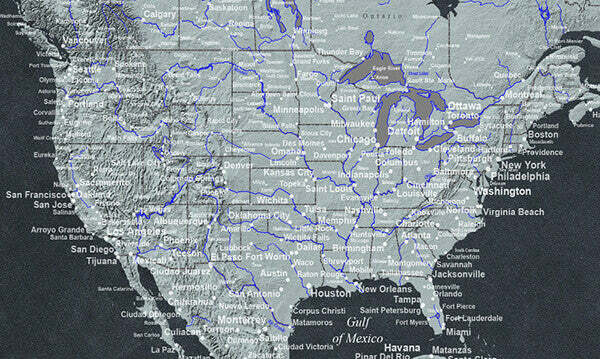 All 50 US states are outlined and labeled so you can pin your US and World travels all on one map. Antarctica has been removed to create the most amount of pinnable space. The larger size of this 3-panel world map offers bigger font sizes and more surface area to pin. Your canvas 3-panel travel map is sure to become your favorite conversation piece as it becomes the focal point of any room it is hung. Add that extra special touch by personalizing your map with one of our six unique personalization templates. 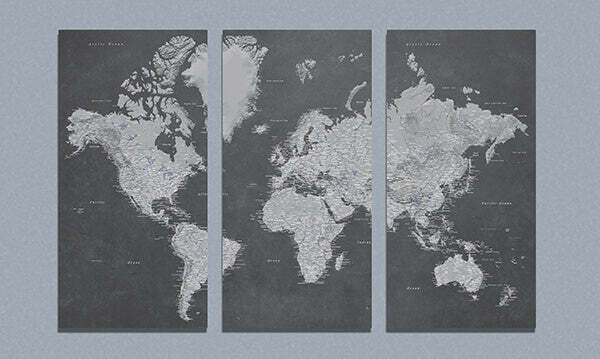 This monochrome canvas world map makes a great gift idea for graduations, retirements, birthdays and more!